After being bullied and abused in the church (and then being told to submit to the “godly leadership” of those abusing me) christianity definitely lost its magic for me. But it started me on a journey of discovering that following Jesus, and attending an institution, are worlds apart – and that real love and freedom is found in Jesus. And that’s a far better place to be. I’m sorry you went through that… And I’m totally tracking with you. I’m so grateful to be where I am right now, even if I’m not sure exactly where that is. The Catholic perspective is not much different. We were told even more ridiculous things – like cannibalistic crackers! 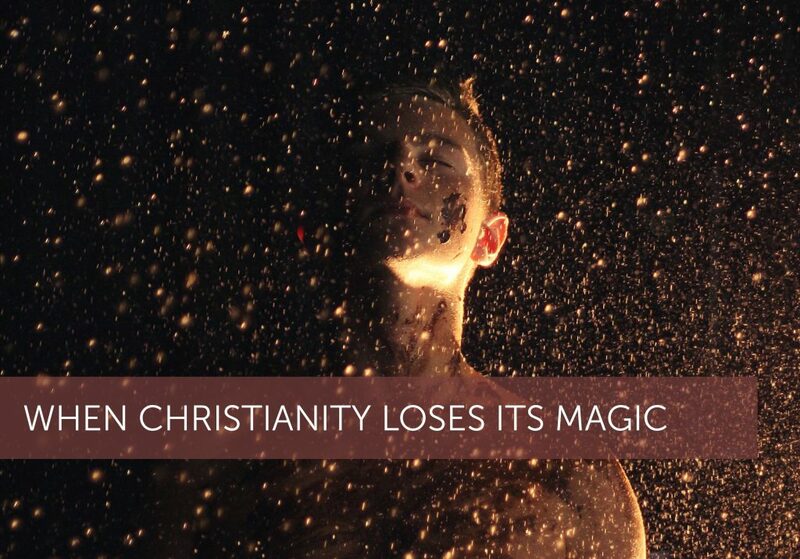 What would Christianity be without magic? There would be no miracles, no resurrections, no souls, no afterlife. And that’s exactly what the core theory – the standard model of physics, tells us. There is no magic in the natural world in which we reside. We know exactly what our particles are and are not capable of, and if there were magical forces like gods and souls, we would have found them by now, or would at least have to try to explain things particles do for which there is no explanation – but there are no such things particles do that can’t be explained. The gods died on July 4, 2012 with the announcement of the Higgs boson. All that remains is to write the obituaries, and move on, with the understanding that this is all we get, so we should make the best of it. There are some Christians who are in the same spiritual place as you seem to be, who are passionate about social justice and equality for all, who speak out for the marginalized and oppressed. Many of them are in churches fundamentalists and evangelicals call “liberal” or even “heretics,” although people like me call them “Christian.” We join with Muslims, Jews, Buddhists, Unitarians, Mormons (yes, there are some progressive Mormons out there, believe it or not) and even some agnostics or atheists with whom we find common cause. We have learned that the Bible is not a magic book – it is a book of sacred stories, embraced not so much for its literal truth as its spiritual direction, interpreted through the lens of love, rather than judgment. Yes, this version of Christianity is different than the fundamentalist kind – this version of Christianity has lesbian ministers, who preside over the sacraments while believing God has called them to celebrate their faith in the Risen One, even while some churches denigrate their gender and sexual orientation. We embrace inclusion. We care because we believe in a God who cares. We can be found in many mainline denominations, and in new communities of faith. We can be found in cities, and outside cities, around the world, wherever education and humanity are valued. I invite you to look for some of our Christians out there. Chances are, we will be marching in protest, or chanting in meditative song. I think you would find yourself welcomed. Theres a difference between identifying doctrines that are wrong vs. Trying to change christianity in favor of your liberalism which you won’t win in doing so. You have an agenda and its bias. You should have tried to be fair, but instead you ignored everything hebraic about the bible. You also want to convince people that god designed you gay and if you’re the same person I see on instagram who trys to make yourself look feminine and dress like a female you’re seriously never going to win and trying to reform christianity into your image. I’m all in favor of gay people receiving the love of Yahshuah, but I am militantly opposed to gay people trying to invade the church to remake christianity in their image.